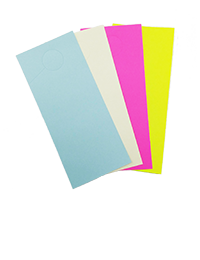 Our rainbow pack of door hangers is perfect for a variety of marketing needs. This pack includes 3,000 door hangers, with three per 8.5” x 11” sheet. With up to four color varieties per pack, you can design unique messages for each blank door hanger, and print right from your home or office! Our Create-N-Hang Door Hangers ™ are perfed for easy separation and the perfed circle is easy to tear out.